Wow country Number 49 ! I have been putting off doing Mauritius as I wanted to make a Mauritian classic, Prawn Rougaille – prawns in a spicy tomato sauce. But because my daughter doesn’t eat seafood, opportunities to have it were small. 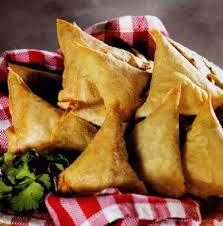 I came up with this recipe as an alternative, it’s also very popular in Mauritius and I thought the twist of adding tuna to a samosa sounded pretty unusual. We love samosa, and enjoyed many tasty varieties in India, particularly when served split open and topped with a ladle of spicy channa dal (chickpea curry)! Yum yum! This version was so good that my kids who aren’t really that fussed on tinned tuna, gobbled them up and even had the leftovers cold for t lunch the next day! Sample great food from the melting pot of interesting cultures from Indian, Chinese and French, and walk in the mountainous interior with waterfalls and rainforest for those who can tear themselves away from the beach and allied water activities. 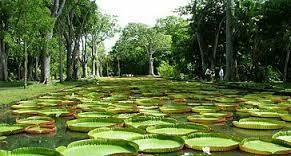 Colourful locals, busy markets especially in the capital Port Louis, lots of historic sights such as the beautifully maintained Chateau de Labourdonnnais and the lush jungle of Black River Gorge National Park. 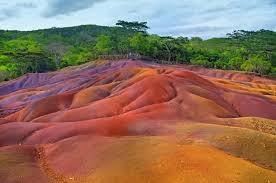 Museums like the mind-boggling Curious Corner of Chamarel, lovely botanical gardens, fun shopping and of course eating out. An interesting blend of cuisines from French, Chinese, African and Indian migrants paired with a wealth of exotic seafood and tropical produce. 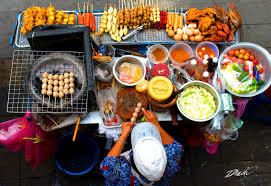 Street food is hot favourite and there is a huge variety of fried treats, and dim sum is popular too. Locals love all things pickled, use lots of spices particularly cinnamon, cardamom, turmeric and cloves, making unusual curries incorporating western herbs such as thyme and exotic meats like duck and octopus.Rice, noodles, flatbread and french style bread are key staples, along with chillis – a hot chilli paste called mazavaroo is served with absolutely everything even fruit! Favourite dishes are rouigalle a tomato, garlic and chilli sauce that is the basis of many dishes, gateauax piment (pepper cake) a spicy fried lentil pattie, and dholl poris, a delicious fried flatbread spread with spiced lentils, rolled up and eaten with pickles, chutney, and vegetables. The abundant tropical fruits are fabulous, particularly good are the small local pineapples and coconuts – either drunk or eaten fresh and still soft. 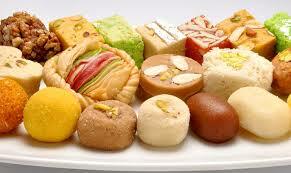 Many desserts feature fresh fruit along with the local vanilla and the delicious boutique sugars, also popular are the rich fudgy Indian sweetmeats called mithai. Mauritius is a big producer of some of the worlds best vanilla, and vanilla infuses many things including a delicious black tea and rhum. Sugar is another main crop and so rum of course is very popular and so are ti rum punches which are flavoured with various fruits and spices. 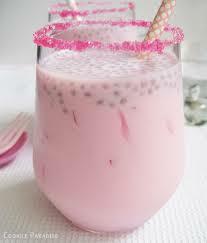 Phoenix beer is made here, and a popular drink alouda is like a weird milkshake with tapioca balls. One thing is for sure, you’ll never go hungry in Mauritius and you’re spoilt for choice with so much delicious food available! Sift flour and salt, rub in ghee. Gradually add water to make a firm dough, can do this in a mixer, then knead 5 minutes only. Cover and rest 20 – 30 minutes. Punch down, and divide into even golf ball-sized balls.Keep rest covered while working. Roll out each ball into a 20cm circle, cut each circle in half, brush straight edge with water, fold over straight edge to straight edge, to form a wedge shaped pocket. Heat oil in frypan, saute onion, ginger and chilli until soft. Add spices and fry 1 minute, stir in tuna, breaking up lumps. Cook 2 minutes, stir in coriander and cool. To put together : Take a pocket, fill with tuna mix, don’t overfill – pinch edges together to tightly seal. Can do this with a fork. Meanwhile heat oil in a deep fry pan, deep-fry samosa until golden brown. Drain. Heat oil in a saucepan, fry onion till soft, add ginger, chilli and garlic, fry 1 minute. Add curry leaves, fry 1 minute, add spices and stir till fragrant. Stir in tomatoes, and rest of ingredients, cover and simmer 15 minutes. Serve at room temperature with hot samosas. Even my kids who don’t like tuna, loved these tasty treats, and we all voted to have them again, so a great dish, scoring an 8/10. 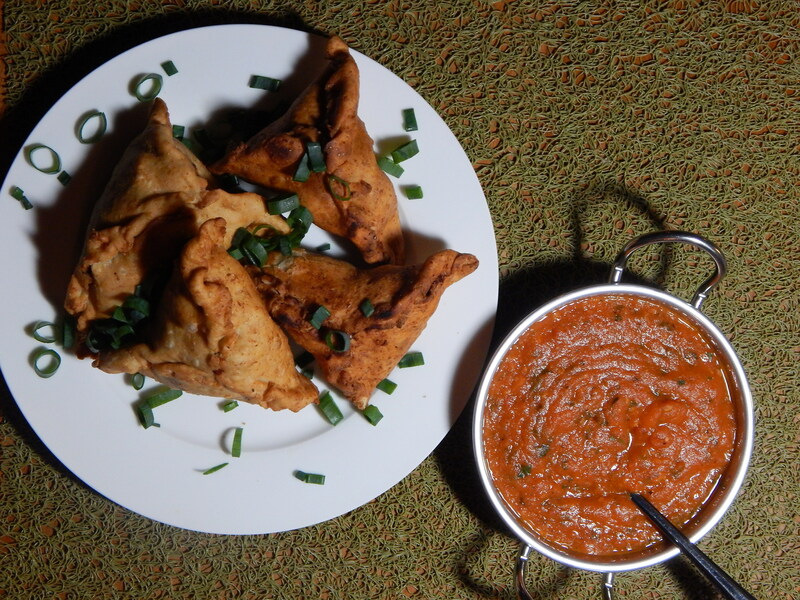 The spicy tomato sauce really complimented the samosa, so it’s worth making that as well.